This hot sauce can be easily used as a marinade or a sauce! The mango and honey give it just enough sweetness to balance out the spice, and the cilantro gives it a bit of freshness to really liven up the flavor of the sauce! You can kick up the heat by leaving some of the seeds/ribs of the habanero peppers in, or milder by removing all of them. 1. Saute carrots and onions in a bit of olive oil on medium low heat until soft. Let cool. 2. Add all ingredients to a blender or food processor, and mix until a sauce has formed. If it’s on the thicker side, add a bit of water or extra lime juice to thin it out. Refrigerate up to 2 weeks. Enjoy! *I used the hot sauce as a marinade for some shrimp! I poured 1 cup of the hot sauce over 25 raw shrimp and refrigerated it for 30 minutes. 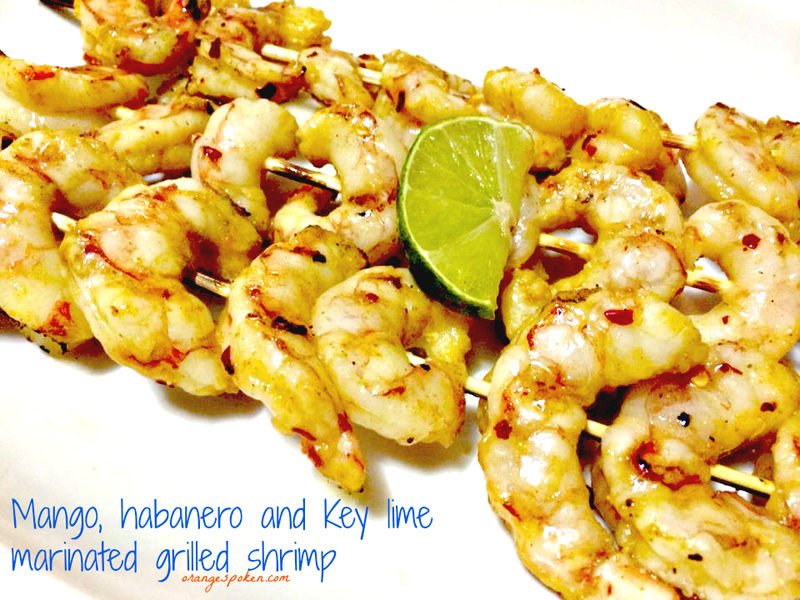 I then placed the shrimp onto soaked skewers and grilled 2 minutes on each side, until the shrimp were pink and tender.